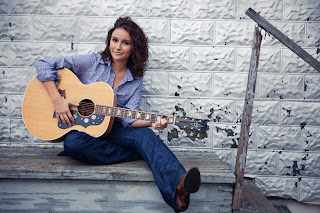 Ashton Shepherd is an american singer-songwriter from Coffeeville, Albama. Ashton has released two albums, Sounds So Good in 2008 and Where Country Grows in 2011. As an artist she has never had a number one however her highest charting release was her second album which reached number 11 on the US Country chart. Ashton was unfortunately dropped from her record label - MCA Nashville - a few weeks ago however she has said that she is looking at putting together songs for a new album. Perhaps my favourite song from Ashton is the title track of her second album, Where Country Grows. The message behind the song is a lovely one and sticks close to Ashton's Southern roots. Ironically when Where Country Grows was released as a single (the second from the album) it became the only one of her singles that didn't chart in the top 40 and didn't chart in the Billboard 100 at all. Another strong song from the album is Rory's Radio. The song has a similar message to in that it talks about experiences growing up. Ashton sings about life experiences very well and many of the songs on the album are about various experiences although she still manages to keep the songs different enough that a listener doesn't get bored. My least favourite song of Ashton's is That All Leads To One Thing. Whilst still a good song I find the song can get a bt repetitive and I feel there are a lot stronger songs on the album than this. Whilst Ashton has a very Southern voice, I still think her music is definitely worth checking out by anyone from dedicated country fans to people who are only just starting to listen to country. She's a very good singer and I hope she sorts out a new record label soon as I'd love to hear some new music from her!